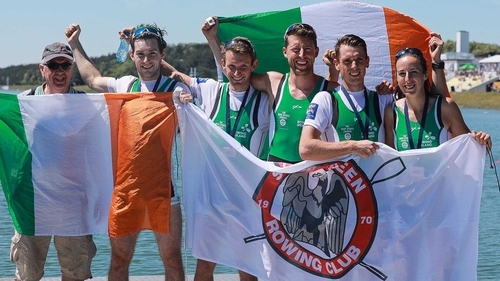 Shane O'Driscoll and Mark O'Donovan scorched to a superb European Championships lightweight pair gold on Sunday morning, with clubmate Denise Walsh taking silver immediately afterwards and Paul and Gary O'Donovan also making the podium on an astonishing morning for Skibbereen Rowing Club. Starting in lane one, O'Driscoll and O'Donovan made a strong start, showing good rhythm to set the early pace and finding themselves in a tie for the lead with Great Britain after 400m. They drove on in search of an early advantage and led outright after 600m. At the halfway point, the Irish pair were a length clear of Italy and Turkey, a lead they would not relinquish. O'Driscoll and O'Donovan simply didn't let up the pace, stretching their lead towards the 1500m mark and closing out a hugely impressive success as O'Donovan brothers Paul and Gary roared encouragement from the banks. Immediately afterwards, Walsh produced a brilliantly timed row to take silver in the lightweight women's single sculls. Emma Fredh of Sweden took gold but Walsh - fourth after 1,000m - surged to get on the podium and make it a memorable morning for the Irish. Defending their title, the O’Donovans bided their time in their lightweight men's double sculls final, trailing at the back after 500m as the French and Italians set the pace. Wary not to give up too much ground, they picked up the pace but were still fifth at the halfway point. Heading for the final 500m, the brothers made their move, but met stubborn resistance from the Italians and Poles. In a breathless finish, France took gold and the Irish siblings squeezed into the silver position to cap an incredible morning for Ireland, and an astounding achievement for Skibbereen.